High-Cost Contests Up And Down The Ballot Made The 2018 Campaign Unlike Any Other Michigan Has Seen, And We Don’t Have All Of The Disclosures Yet. 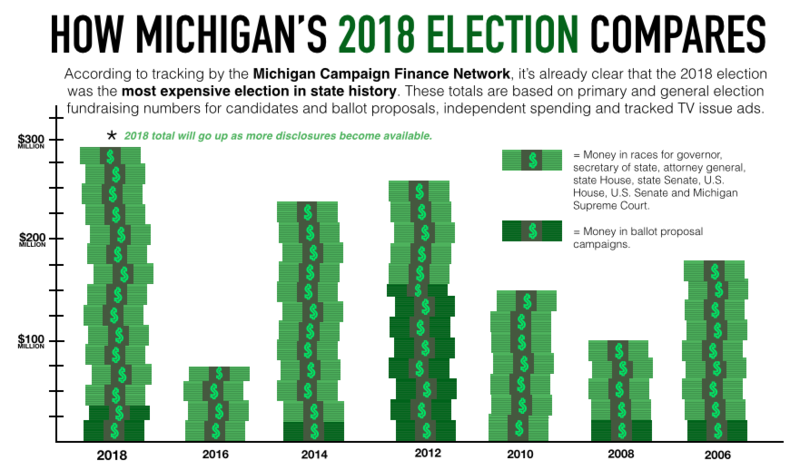 LANSING (NOV. 13, 2018) — Thanks to a swarm of high-priced campaigns and changing laws that made it easier for large donors to pour money into political races, Michigan’s 2018 elections were the most expensive in state history. An analysis of campaign finance disclosures, TV ad-tracking data and other filings on ad spending backs up this conclusion despite the fact that some of the money involved in the November election won’t be publicly reported until January 2019. At this point, the Michigan Campaign Finance Network has tracked about $291.1 million across the ballot proposal campaigns and the state’s races for governor, attorney general, secretary of state, Michigan Senate, Michigan House, Michigan Supreme Court, U.S. Senate and U.S. House. The $291.1-million total will go up as more disclosures become available. The previous high for money in those campaigns and races was about $262.3 million in 2012. Adjusted for inflation, that total would be about $288.6 million. However, the 2012 election was much different because $154.2 million of the total went to ballot proposal campaigns. There also weren’t races for governor, attorney general, secretary of state or Michigan Senate that year. The previous high for a mid-term election came in 2014 when the elections attracted about $243.7 million. The 2018 total is already up $47 million or about 19 percent over the 2014 total. And the 2018 total will increase. What’s unknown is how much it will go up. 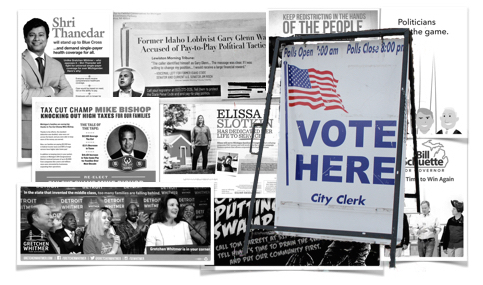 — And so-called TV “issue ads” that criticized or promoted candidates but didn’t expressly tell viewers how to vote so they didn’t have to be reported in state campaign finance disclosures. The Michigan Campaign Finance Network tracked “issue ads” on TV by analyzing ad-tracking data from Kantar Media/CMAG and by digging through Federal Communications Commission filings made by TV stations about the ad time they sold. MCFN will continue to update its analysis of the overall amount of money as more disclosures become available. It will also continue to examine the sources of the money. Why Was 2018 So Expensive? A grab bag of factors helped make 2018 the most expensive election in state history. One of them is Michigan lawmakers voted to double the state’s campaign contribution limits in 2013. The 2018 election cycle was the first four-year election cycle in which the new limits were in place for all four years. The increased limits were most felt in state legislative races. There, the caucus committees of the House Democrats, House Republicans, Senate Democrats and Senate Republicans were able to raise unprecedented amounts of money, which they poured into competitive races. Before the limits were changed, donors could give $20,000 per year to a caucus committee. Under the new limits, a donor can give $40,000 per year. For a four-year cycle, that’s a difference of $80,000 more from a single donor. The four caucus committees combined to raise $14.8 million from Jan. 1, 2017, through Oct. 20, 2018. Their previous high over the same period was $10.8 million before the 2006 election. Another major factor was the spending of super PACs, groups that can accept unlimited contributions directly from corporations and spend unlimited amounts to influence races but are supposed to act independently of candidates. There were more super PACs active in Michigan’s 2018 election than past elections. Of the state’s 20 largest PACs, 11 were super PACs. The 11 largest super PACs combined to raise $20.7 million between Jan. 1, 2017, and Oct. 20, 2018. Also, for the first time in 2018, the state saw candidate-focused super PACs emerge in the primary races for governor. In the GOP primary, a super PAC called Better Jobs, Stronger Families supported Attorney General Bill Schuette for governor, and a super PAC Calley Continues Comeback supported Lt. Gov. Brian Calley. Combined, the two super PACs raised $3.6 million. Another factor in the cost of the 2018 elections in Michigan was the large price tag attached to races for the U.S. House, where Democrats saw a bump in candidate fundraising compared to past years. Michigan’s 2018 races for the U.S. House attracted more than $76 million (candidate fundraising and outside spending), according to the public disclosures currently available for the primary and general election campaigns. The races included the most expensive U.S. House contest in state history, which occurred in the 8th District between incumbent Rep. Mike Bishop, a Republican, and Elissa Slotkin, a Democrat. MCFN has now tallied about $26.7 million in that race alone. About $16.6 million of the total came in the form of independent spending by outside groups and about $10.1 million was raised by the candidates. Slotkin ended up winning the race.